Augmented brand awareness: When your target audience surfs the web, your brand shows up consistently in the search results. Increased brand inclination: Content marketing helps to further establish your brand as a thought leader in your industry, which fortifies the relationship with your target audience. Better reach at lower cost: Content marketing is a long term strategy and over time, a collection of great content will continue to reach more qualified leads and interested buyers. 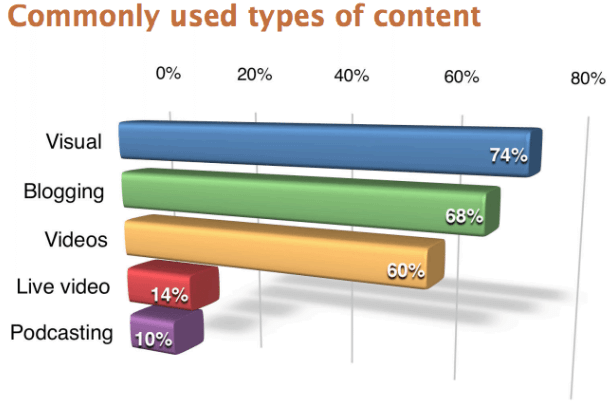 How are companies using content marketing? Social Media remains the most popular platform for distributing content to reach specific audiences. Social networks such as Facebook, Twitter, Instagram, Linkedin, Pinterest ensure that the content reaches the target audience irrespective of the geographical location in nanoseconds. e-newsletters, ebooks, microsites, case studies, blogs, whitepapers help brands establish themselves as knowledge platforms and thought leaders and webinars, podcasts and videos will drive the next wave of content marketing as they lead to more engagement with the audience and better conversions. Native video content: Content marketers will develop their own native video content to attract the audience to their brands and keep them engaged. According to a recent Linkedin survey, 80% of all content consumed on internet will be videos by 2019. Another survey reveals 52% of marketing professionals across the globe suggest that video content generates the best ROI. Employee Advocacy: Companies will develop high quality video content to gain and strengthen the trust of their customers. For this, they will empower employees to be the voice of the brand. Empowering employees to be thought leaders will expand the brand’s fanbase. According to a Linkedin research, Brand messages distributed by employees are re-shared 24 times more than when distributed by the brand. Use of infographics: Brands will continue to use infographics in 2018 as it ensures to tempt readers, and help marketers to dish out all relevant information in highly engaging and easy to digest manner thus building trust with the consumers.